Ardennes Disc Brake - HED CYCLING PRODUCTS INC.
Ardennes Disc Brake wheels can be had in several variations. The LT is our lightest, fastest, and fanciest version, with Hed round spokes and our new 545 J-bend hub. The GP offers incredible performance at a great price point, featuring a reliable 4-pawl hub. 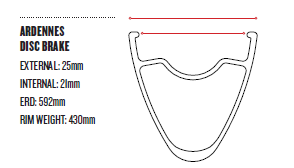 All clincher Ardennes Plus Disc Brake wheels use the same 25mm wide, tubeless-compatible rim, to bring the most out of your tires. All Ardennes Plus Disc Brake wheels accommodate every modern axle standard: Quick Release, 15mm front thru axle, 12mm front thru axle, and 142x12mm rear thru axle. For LT wheels, please specify which axle you need at the time of order. GP wheels come stock with 12mm or 15mm front thru axle end caps, and rear 142x12mm axle; QR kit sold separately. Disc Brake compatibility = Shimano Centerlock.